We are thrilled to announce that two Whittier Tech teams earned bronze medals at the SkillsUSA national competition last week! 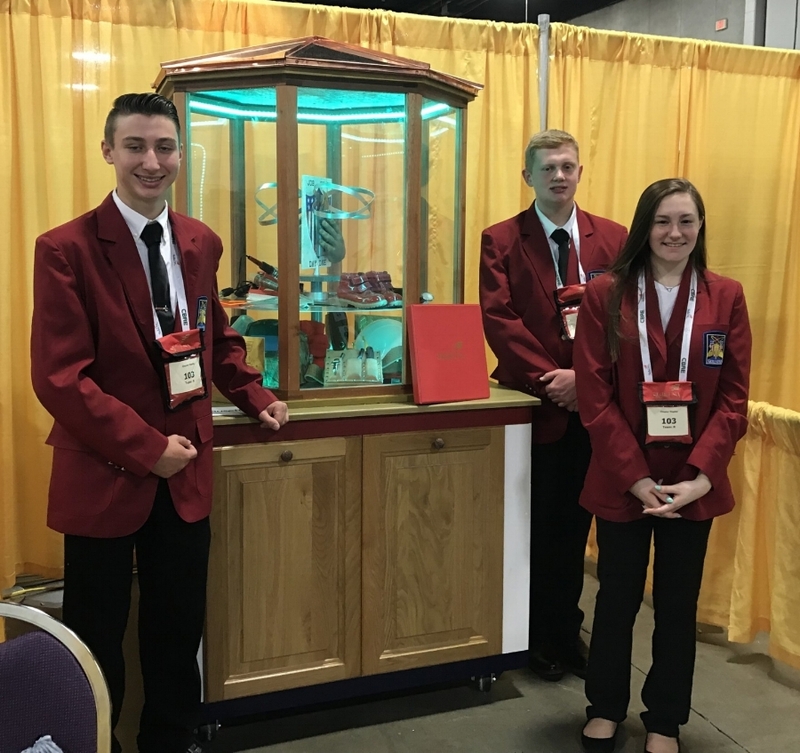 Students who earned gold at the SkillsUSA state competition in April moved onto the national round on June 25-30 in Louisville, Kentucky. Incoming seniors Larissa Havey, of Amesbury, Emily Shal, of Amesbury, and Allasandra Thompson, of Haverhill, earned bronze for their career pathways showcase in health occupations for their "Music and Memory" program, which benefits patients with Alzheimer’s disease and dementia in nursing homes. "I have never felt so much joy in my life, not only being able to represent my school, but being able to care for these residents. We put so much time and effort in trying to improve their quality of life," said Havey. "Overall, Kentucky wasn't about winning. It was about getting to experience this joy and memories with the people." Graduates Tyler Paolucci, of Georgetown, Jacklyn Verrette, of Haverhill, and Mackenzie Maguire, of Merrimac, also earned bronze in the career pathways showcase in the industrial and engineering technology cluster for their CAD design of Whittier's new Allied Health Center. During the competition, students presented their projects to a panel of judges and were judged in a number of areas, including speaking skills, community impact, demonstration of technical skills and integration of business and industry. "The six students who placed in the national competition demonstrated unbelievable teamwork, commitment and passion throughout their projects and over the last several months participating in SkillsUSA," said Whittier's SkillsUSA Co-adviser Jane Moskevitz. "Our teams had some stiff competition from 40 other teams and for them to place is reflective of the superb work they completed. They should be proud, and know that they have the academic and technical skills to excel outside of Whittier." Incoming seniors Kaitlyn Cook, Ethan Rousseau and Adam Bellville -- all of Haverhill -- also have reason to be proud of their work in the chapter display category. This season marked the first time in 16 years that Whittier entered a team in this section of the competition, with the three earning seventh place out of 44 teams. Projects had to represent this year's theme -- "Job-Ready Day One." "Just to make it to nationals is an accomplishment, and these students should be so proud of their hard work," Moskevitz said. "We've learned so much this year just seeing what other teams produced and we're confident we'll be back next year." SkillsUSA is a partnership of vocational-technical and career students, teachers and industry leaders who work together to promote and ensure a skilled workforce in the U.S. More than 395,000 middle school, high school and college students and professional members are enrolled in training programs in trade, technical and skilled service occupations. Incoming seniors Allasandra Thompson of Haverhill, Larissa Havey and Emily Shal, both of Amesbury, earned a bronze medal for their career pathways showcase in the health services cluster. Graduates Tyler Paolucci, of Georgetown, rear, and Jacklyn Verrette, of Haverhill, front left, and Mackenzie Maguire, of Merrimac, earned a bronze medal for their CAD design of Whittier's new Allied Health Center. Left to right: Incoming seniors Ethan Rousseau, Adam Bellville and Kaitlyn Cook, all of Haverhill with their Chapter Display project.